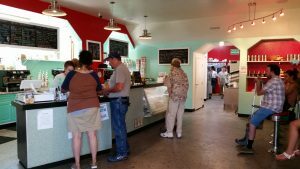 Graff Dairy, a longtime fixture in town at 581 29 Road, has gotten a complete makeover and is now a fantastic place to stop to get your espresso and ice cream fix. 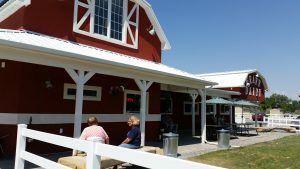 Graff Dairy 2.0 is clean, spacious and bright, with tables and umbrellas on a nice front lawn where you can sit to eat your ice cream. It also now has a very welcome more sophisticated edge that this town really needs. 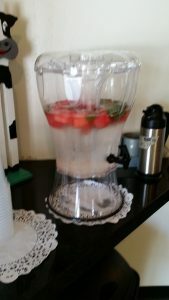 For example, they offer free water flavored with chunks of fresh watermelon and sprigs of rosemary — a nice flair. Some local stories have reported that their ice cream is the same as it used to be, but it really seems much better than that. The old Graff ice cream seemed little better than ice milk, but the new Graff ice cream seems richer and more flavorful, like it has a higher butterfat content than it used to. The menu is impressive, too, and the espresso coffee is very good quality. They offer home-made baked goods and locally-made fare for sale, like apricot syrup and Zesty Moose spices, and their grab-n-go drink cooler offers far more interesting items than local convenience stores: San Pellegrino sodas, a spicy ginger beer form Portland, Maine, and Big B’s ginger lemonade and apple juice from Paonia, for example. You can also get a dish of soft-serve ice cream with two shots of espresso over it — “the “Affogato” — a delicious combo that’s hard to find in Grand Junction. So run over and give the new Graff Dairy a try. You won’t be disappointed. 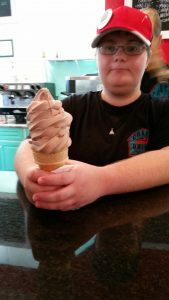 It’s well worth a jaunt across town, and to make it even better, Graff Dairy’s mission is to give homeless teens a place to work and earn some money. You can’t get any better than a combo like that.